Valentine’s Day doesn’t always have to revolve around bouquet of roses and teddy bears holding hearts. With a little creativity and thoughtfulness, you can celebrate this day in a way that your family will remember for a very long time. A perfect time to show how much you love each other. Pack a picnic: If you live in a warmer climate and you’re playing hooky from work or school, pack a picnic with everyone’ favorite snacks and grab a Frisbee for a fun-filled day at the park. End the afternoon with a trip to the ice cream shop or your favorite cafe for a sweet treat. Fill a jar of sweet words. Craft a jar that holds sweet words for the family. 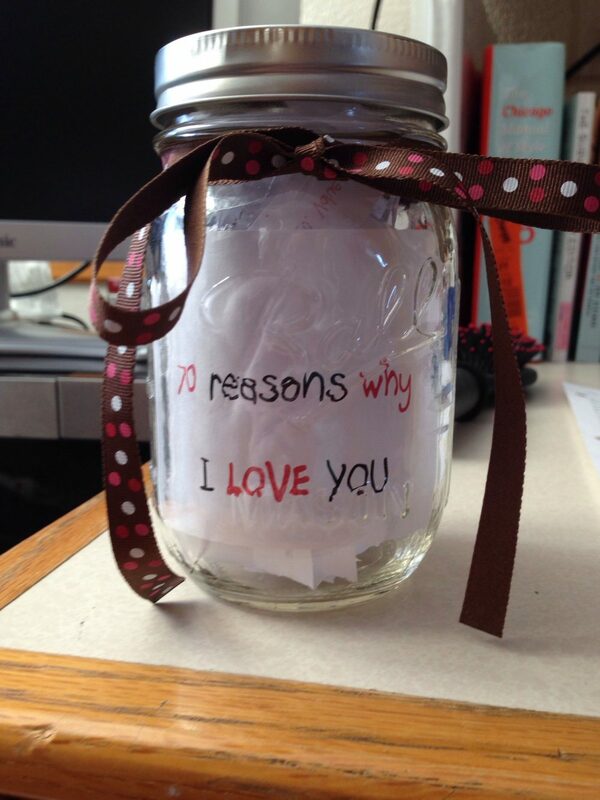 You could have a theme for your jar – for example, “20 Reasons Why I Love Being Your Mama” or “20 Things Daddy Does That Make Me Smile.” You could either write down these little love notes or print out from the computer. Decorate the jar with tissue paper, magazine clippings, old calendar pages, and some decoupage. These little kind words of affirmation can go a long way to the recipient to hold on to! Craft a box of memories. Up cycle an old shoe-box into a box of favorite family memories. Encourage family members to write these memories down and contribute. 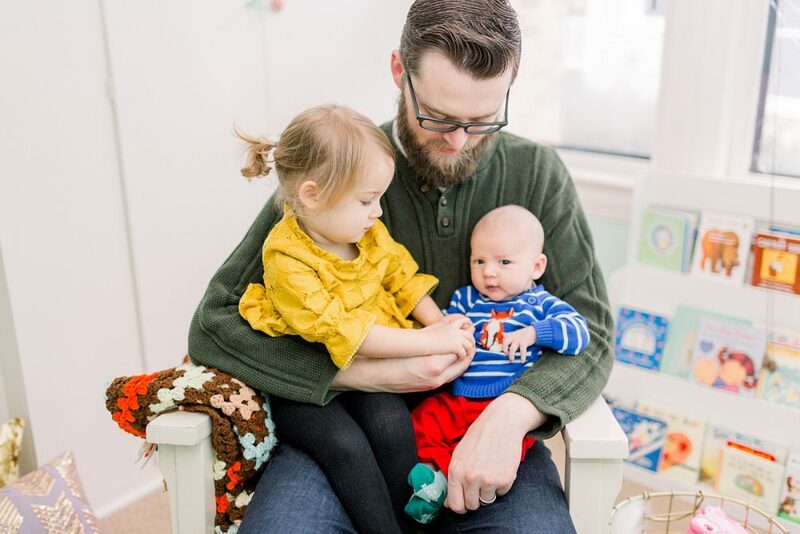 Children from preschool age on up can contribute the memories that mean the most to them, and they never tire of hearing stories from when they were babies and toddlers. Spend time together on Valentine’s Day going through the box and discussing some of the best times you have shared as a family. Write an Emotions Book. All this talk about love makes an excellent jumping off point for talking about all kinds of feelings. Parents of younger children can print out “My Heart . . . A Book About Feelings for each family member.” Filling in the pages offers valuable talk time as you get to know each other a little better by exploring feelings. Enjoy a Scrapbook Day. Start a new family tradition cantered around photographs from the previous year. It doesn’t matter if your family’s picture archives are as simple as traditional, plastic-sleeved photo albums or as elaborate as professional-quality scrapbooks; what’s important is taking time to stay up-to-date on your preserving family memories. What better way than Valentine’s Day to look back on the ways your family loved each other in the previous year? Take IT A Special Meal-Day: Use breakfast/lunch/dinner as an important part of Valentine’s Day. You could also dress up and eat out at a favorite restaurant, but most of the moms prefer to celebrate with their family at home. For e.g. try heart-shaped pizzas for the Valentine’s Day dinner. Everyone gets the chance to add their own toppings: first to the regular pizza dough ones and then to the cookie dough dessert ones. The choice of make-your-own pizzas is such a hit with the kids, they often request it for their birthday meal. Tend to others. Visit a home for the elderly or a hospital wing on Valentine’s Day. 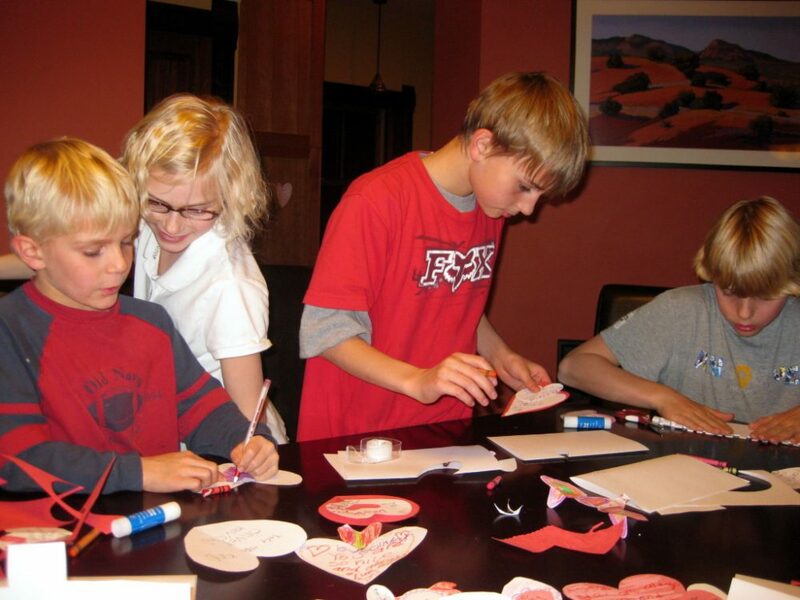 Take homemade Valentines with you or bring along the supplies to make Valentines with the people you are visiting. So often, the very presence of others is more of a gift than a glittery piece of cardboard, so don’t worry too much about what you have made – just focus on connecting with others. Years down the road, the kids will remember, the rituals and time spent with them & the family. Build tradition to create memories that will last a life time.